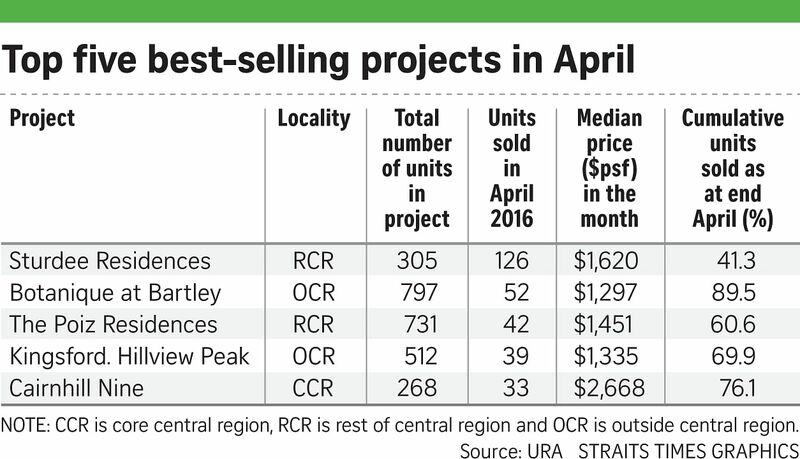 Sales of new private homes fell in April from March, but demand continued to be steady for some previously launched projects. Developers sold 745 new private homes last month, 11.6 per cent down on March, according to Urban Redevelopment Authority data yesterday. New private home sales had hit an eight-month high in March, with the launches of the 268-unit Cairnhill Nine and the 216-unit The Wisteria. There were two new launches in April - the 305-unit Sturdee Residences and The Asana, which has 48 apartments. If transactions from new launches are discounted, sales from previously launched projects rose from 541 in March to 619 last month. "Demand was more evenly spread out (across different projects), with the top 15 best-selling projects each selling 18 units or more last month," said Mr Wong Xian Yang, OrangeTee senior manager of research and consultancy. "This could imply a slight improvement in sentiments and a spilling over of pent-up demand into the market." He added that buyers have gone back into the market as they no longer expect the Government to lift cooling measures any time soon. April's sales figure was 36.2 per cent lower than in the same month last year when transactions were boosted by the launch of the 920-unit North Park Residences and 797-unit Botanique at Bartley. Still, compared with a year back, there were more units sold at previously launched projects as well, possibly because developers have trimmed prices. "Some projects are completing soon - for example, The Trilinq next year - and this attracts some buyers as they are able to move in soon," said Dr Lee Nai Jia, DTZ regional head (SEA) of research. There are now fewer unsold units in the market, thanks to this steady rate of demand soaking up developers' inventory and the reduction in Government Land Sales since 2014, said Mr Alan Cheong, Savills Singapore research head. The stock of unsold private homes has fallen from 20,433 in April 2015 to 16,718 in April this year, he noted. The executive condominium market had a busy April with 1,260 units released for sale - the highest total in 17 months, said Mr Ong Teck Hui, JLL national research director. Parc Life EC sold 51 of 628 units at a median price of $784 per square foot (psf) while The Visionaire moved 154 of 632 units at a median price of $821 psf. Several previously launched ECs, including The Amore, The Brownstone, The Terrace and The Vales, also clocked sales of around 40 to 50 units each. The Terrace EC had a buyer-refer-buyer scheme, where a new and existing buyer would get a $10,000 cash voucher from the developer. Including ECs, 1,291 new private homes were sold last month, 2.8 per cent lower than in March. Home buying momentum should continue, especially as more projects are completed and as pricing becomes more attractive, especially for larger units, said Dr Lee of DTZ. "However, buyers are still cautious amid the uncertainty of the global economy. So buying momentum is likely to continue for projects at choice locations." Gem Residences in Toa Payoh, Gramercy Park in Grange Road and Stars of Kovan will be launched in the next month or two.